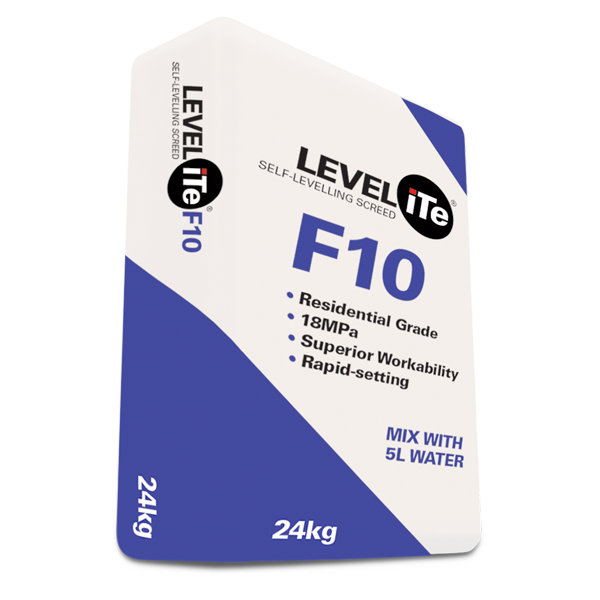 LEVELiTe®FX is an Express, Rapid Set self-levelling floor screed compound developed for a wide range of applications including residential, commercial and light industrial applications that sets to 25MPa. LEVELiTe®FX has been specifically formulated to enable same-day installation of floor coverings. It is suitable for use on cementitious screeds, concrete power floated surfaces, hardened old adhesive residues and soundly adhered ceramic and similar surfaces. Its high strength formulation has been designed to repair a variety of sub-floor types, including cement/sand screeds, and concrete floors. The applied compound can be walked on within an hour, and the flooring installed some 3 to 4 hours after application. A special test is conducted to determine how rapidly the flooring can be laid. LEVELiTe®FX can be applied in a feathered finish down to approximately 0,3mm, up to 15mm thick in one application. LEVELiTe®FX is resistant to moisture once cured, and will not swell or delaminate. Final strength is 25MPa. NOTE: For internal use only due to the inability to control environmental factors such as wind or heat. It is recommended that direct to ground sub-floors be protected from rising damp to prevent dimensional changes in the floor covering (confirm the maximum permissible moisture content that the floor covering or adhesive can tolerate). LEVELiTe®FX is resistant to rising moisture and should not swell or delaminate if exposed to reasonable moisture. Standard European practice has evolved that when vinyl flooring is to be installed, the surface bed is to be sealed with an epoxy moisture barrier, or similar. 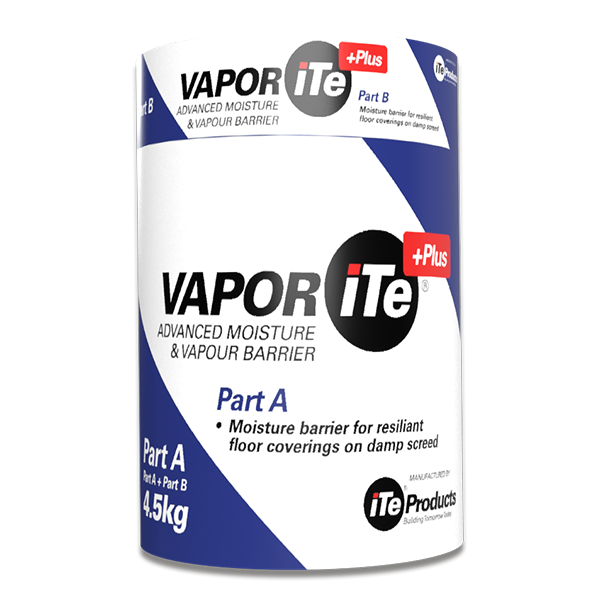 VAPORiTe®+PLUS epoxy moisture barrier system has been specifically developed for this purpose. Please refer to the VAPORiTe®+PLUS data sheet. The surface must be hard, sound, dry and free of dust, dirt and other materials such as grease, oil and paint. Due to its flow characteristics, sealing strips should be placed at doorways or where the levelling compound is not desired. BONDiTe® primer and bonding agent is an essential component in priming the substrate prior to application of LEVELiTe®. 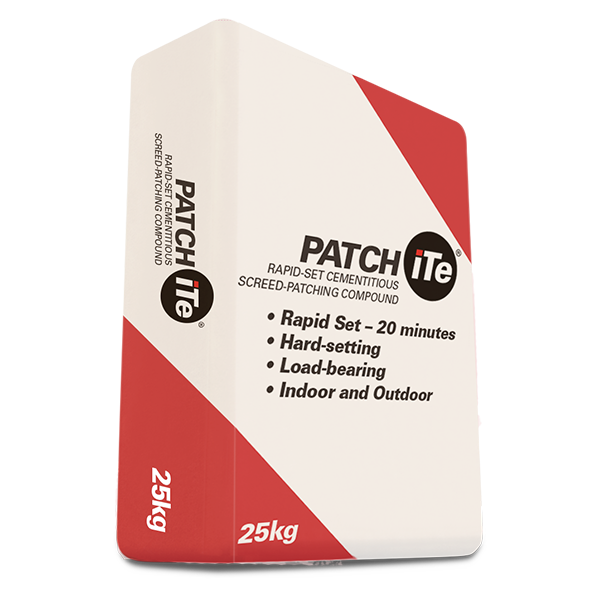 It acts as a pore sealer which will maintain the flow life and prevent air bubbles rising through the applied LEVELiTe® screed smoothing compound. Accordingly it is necessary to prime all surfaces with BONDiTe®. With very smooth non-absorbent sub-floors e.g. power floated floors, epoxy coated water barriers, and ceramic tiles it is essential to apply iTeSLURRY® or to lightly grind the surface to promote adhesion. When the slurry is dry, the surface should be ready for application of the LEVELiTe®FX levelling compound. Use 5.0 liters of water per 21,5 kg bag. Do NOT over-water. Add the powder to the required amount of clean cool water in a clean mixing container whilst using a +/-600 rpm electric paddle mixed until a lump free screed is produced. This will take approximately 3 to 4 minutes. Stop the mixer and scrape the inside of the mixing vessel to allow any unmixed product to fall onto the paste. Briefly remix the LEVELiTe®FX and then discharge onto the affected floor. Mixed LEVELiTe®FX should be applied within 5 minutes at 20˚C. This time is extended at lower temperatures and reduced at higher temperatures. LEVELiTe®FX can be applied at a minimum thickness of 0.3mm to a maximum of 10mm in a single application. Approximately 1.5 kg of LEVELiTe® per mm per m² will be required. BONDiTe® must be used as a primer onto the concrete substrate to prevent air bubbles from rising once the LEVELiTe® is applied, to ensure a proper flow of the compound over the substrate and to bind the surface well. BONDiTe® is applied at an average of 4m² per litre. In order to maintain a constant even drying process, windows should be closed and drafts avoided during the initial set. Once the initial set Is evident, accessible doors and windows should be opened to minimise the build up of atmosphereic moisture. All supplied data is based on laboratory tests conducted at 20 C, and a relative humidity of 50% as required by international standards. Based on practical building site conditions, temperatures should be between 10°C and 30°C. When higher temperatures are experienced, the drying will accelerate and allowance for this needs to be made by the applicator. Actual conditions experienced may result in slightly different results. Experience has shown that to achieve the best results iro levelness, a depth of 4 to 5mm or more should be poured. Specialist applications such as bulking out should be discussed with our technical staff. Please do not hesitate to contact us for training or any queries you may have. Do not ingest. Keep away from children and pets. Do not empty into a drain. When used continuously, wear rubber gloves, and rinse thoroughly to remove any residue. If the eyes are contaminated, rinse with cold water. If irritation persists, seek medical advice. For further information consult the relevant health and safety data sheet. The information supplied in our literature is given in good faith. We reserve the right to modify information supplied as and when needed. iTeProducts warrants that LEVELiTe®FX is manufactured to the highest possible standards and that it contains no defects. It is warranted that when applied in accordance with our relevant method statement by accredited applicators trained by us, the compound will perform as required for the lifetime of the floorcovering installed on it. iTeProducts cannot be liable for factors outside of its control, such as defective substrates. Pour the mixed LEVELiTe®FX onto the prepared sub-floor. The mixed mortar will flow out and self-level. Use a suitable notched epoxy rake or spreader to obtain the required thickness; while a long-handled pin leveller/rake with height adjustment will simplify this operation and yield more consistent results. A long handled spiked roller must be used to prevent air blisters from marring the finished surface. 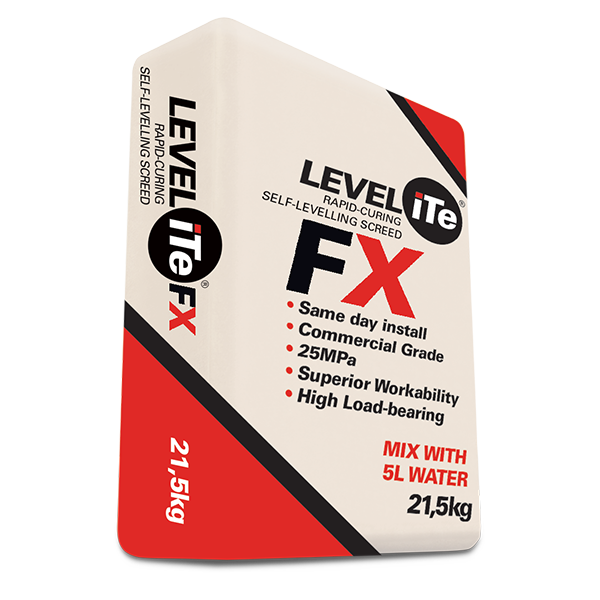 LEVELiTe®FX has excellent self-healing properties which extend for some 30 minutes or longer after the pour, which minimises cold joints and surface irregularities.